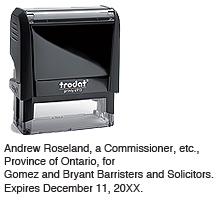 Trodat Commissioner Self-Inking Stamp 7/8" x 2-3/8" (22mm x 58mm). Standard Trodat 4913 commissioner self-inking stamp. 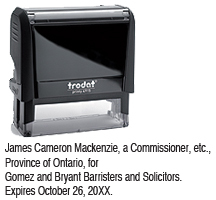 Trodat Commissioner Self-Inking Stamp 1" x 2-3/4" (25mm x 70mm). Medium Trodat 4915 commissioner self-inking stamp. Seal border will appear on stamp. Text will be formatted to fit this style. We will arrange your text as sample, adjusting text to fit area. Trodat Commissioner Self-Inking Stamp 1-11/16" round (45mm). Trodat 46045 round commissioner of oaths self-inking stamp. Trodat Commissaire à l'Assermentation timbres auto-encreurs 1-11/16po rond (45mm) FRANÇAIS. Trodat 46045 rond Commissaire à l'Assermentation timbres auto-encreurs. Custom Round Seal Self-Inking Stamp 1-11/16" (45mm). Custom Round Seal Rubber Stamp 1-5/8" (45mm) round. Custom Notary Public Rubber Stamp 1-5/8" (45mm) round. Trodat Quebec Commissioner Self-Inking Stamp 1-11/16" round (45mm). Trodat 46045 round Quebec commissioner self-inking stamp. English Text.